As many of you know, there are many different tools you can use when trading cryptocurrencies. In previous articles, we discussed market psychology, support, resistance, and trend lines. We then discussed the indicators “Volume” and “On Balance Volume” to predict price action. In this article, we will discuss another indicator called Moving Averages. “A moving average (MA) is a widely used indicator in technical analysis that helps smooth out price action by filtering out the ‘noise’ from random price fluctuations” (Investopedia). Bitcoin and other cryptocurrencies are known for being extremely volatile. Moving Averages belong to the trend indicator category because they can help you see the general trend without the chop and volatility. It is important to remember that moving averages are lagging indicators. They are best used when a trend is established and generally not used to predict a top or bottom. When used with a leading momentum indicator such as RSI or stochastics, they can help confirm when to take profits and enter trades. Moving averages are a great tool to prevent overtrading. Before we get into using a moving average strategy, let’s first calculate what a moving average is. Two of the most common moving averages are your Simple Moving Average (SMA or MA) and Exponential Moving Average (EMA). Simple moving averages are the average closing price of a security — or in this case cryptocurrency — over a certain period of time. Imagine you’re given the closing price of a Litecoin over a 5 day period: $54, $57, $53.6, $54.5, and $59. Your MA would be plotted at the average of those numbers. The average is the sum of the numbers divided by the total amount of data points in the set. $54+$57+$53.6+$54.5+$59 = $278.10. $55.62 is your 5-day simple moving average. Remember, your 5-day moving average only takes the previous 5 days into account. As another day goes by, your oldest data point is replaced by the most recent closing price. 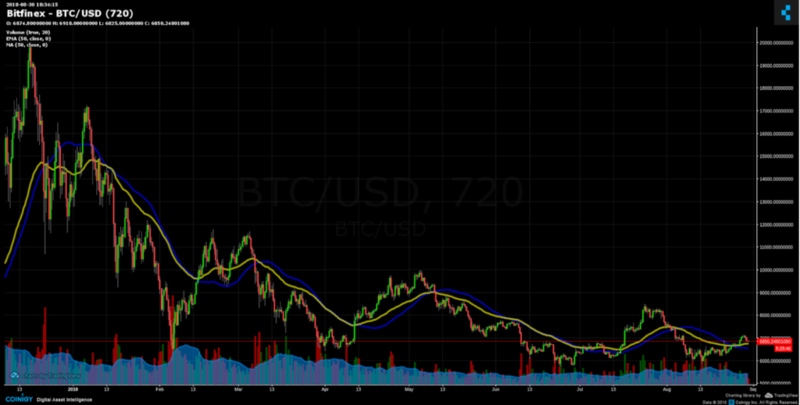 Let’s take a look and compare our 50 EMA to our 50 MA for a 12 hour period. You can see how the EMA leads the MA. EMA is represented in yellow while SMA is blue. Now that you understand moving averages let us discuss how you trade them. In previous articles, we talked about support and resistance. You can trade moving averages by imagining them as your support or resistance lines. First, determine your trend. In an uptrend (price is above the moving average), buy when price touches the moving average as it is supported by that moving average line. 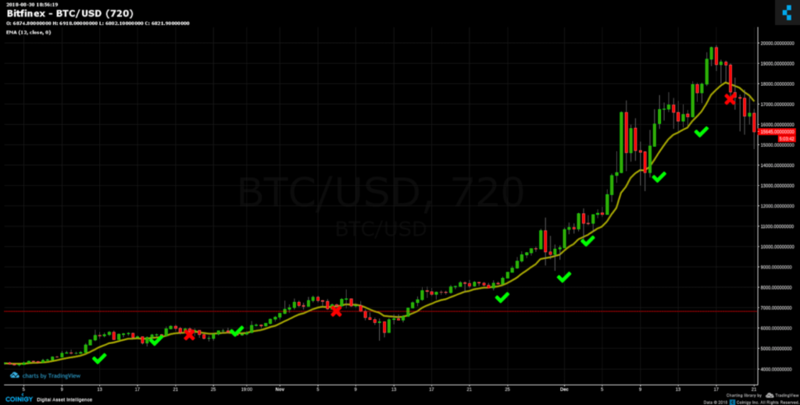 In a bear trend (price trending below the moving average), enter shorts at the moving average line. Before we continue, always remember to place a stop-loss to minimize risk. In this example, you put your stop slightly below the previous horizontal resistance. 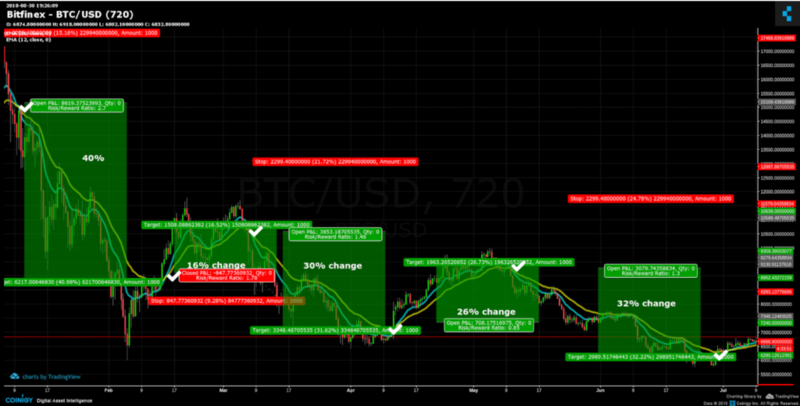 The example uses a 12 EMA on a 12-hour chart. A red X indicates a losing trade using this strategy and a green check is a winning trade using this strategy. Look at the example below during the downtrend. This image shows your 26 EMA on a 12-hour chart. You shorted at the moving average and put your stop above the previous horizontal resistance. As in the previous chart, a red X is a losing trade and green check is a winning trade. You may be wondering why I chose the 12 and 26 exponential moving averages. You want to trade with other traders. Your 12 and 26 are the standard trading moving averages on GDAX/new Coinbase Pro exchange. They also just so happen to be the moving averages used to calculate your MACD indicator. We use them because we know many other people are also using the same strategy. Another popular trading strategy with moving averages is used when you have two moving average lines crossing over each other. This is popular with swing traders. You only trade when the two averages cross into a golden cross or a death cross. Golden crosses signal a long trade; your faster-moving average crosses above your slower moving average. Death Crosses signal a short trade; the faster MA crosses below the slow MA. Look at the example below and the percent gained if you traded each cross. Again, this is using your 12 and 26 EMA on a 12-hour chart. 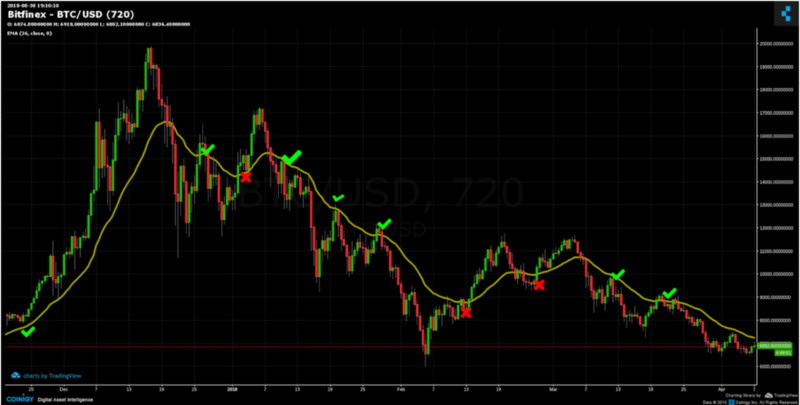 Hopefully, this article gave you a better understanding of moving averages. Remember, this article is for educational purposes and is not to be used as financial advice. As always, manage your risk and use a stop loss. Remember that moving averages are lagging indicators. They are meant to be used with other indicators! The strategies above do not guarantee success. But if you manage your risk over time, you can be successful using them. Good luck!